Lives could be put in danger by plans to cut the number of firefighters on engines in South Yorkshire, the Fire Brigades Union (FBU) has claimed. Crews could be reduced from five to four as the fire authority looks to save up to £4m a year. 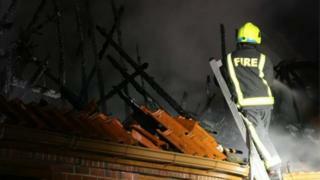 FBU regional secretary Neil Carbutt said public and firefighter safety was at risk as well as the loss of 83 jobs. The fire service said many engines already attended incidents with a crew of four. Mr Carbutt said the news was "devastating for firefighters" and would leave them having to make a moral judgement at call-outs. "Typically on an engine, you'll have two firefighters who go into the building, one pump operator, an overall officer in charge and a fifth person looking after the crew inside, making sure they've got adequate air, water and that the building is stable," he said. "Ultimately, reducing those numbers means people will not be able to sleep safely in their beds at night." The fire service said the multi-million pound shortfall was a result of no longer being able to use cost-cutting shift patterns, which saw some firefighters work four days and nights in a row. That practice was declared unlawful last year after the FBU took the case to the High Court. The organisation said it was also facing cost pressures because it may have to meet a shortfall in pension contributions. It said the only alternative would be to slow down response times by reducing the number of fire engines immediately available. Deputy chief fire officer Alex Johnson said: "We'd rather not make any changes at all, but have a duty to match our resources to local risk and to manage the service in a financially responsible way." The plans will be considered by the fire authority at a meeting on 8 April and if approved, put out for public consultation.